Princess dress in off-white/pink tulle; embroidered applique detail with gemstones. Hoop included, but can be worn without. 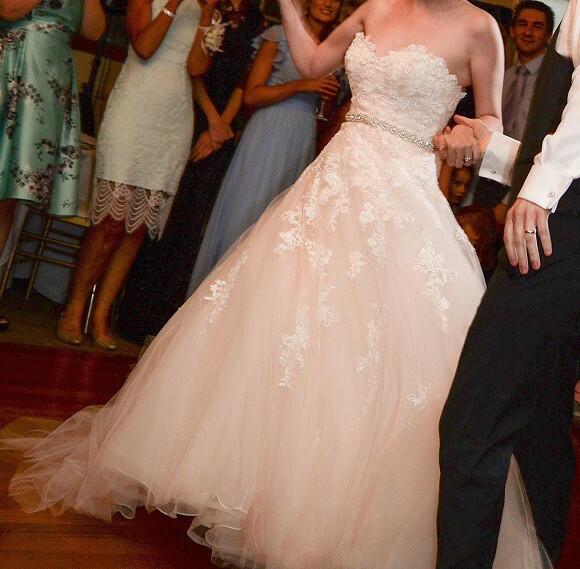 I wore it with hoop on my wedding day to give it more of a ball gown silhouette. I felt like a princess the first time I tried on this dress, and made a few alterations to complete the fairytale-princess look. Some of the tulle is a subtle and gorgeous blush pink colour that received many compliments. Worn once on wedding day, January 2017. Has a built-in bustle to prevent trailing on the dance floor! I'm based in Melbourne, Australia. Please contact me if you have any questions! Straps were removed to create a sweetheart neckline. Boning added for support. Parts of the floral lace detail on the original straps were used to decorate the neckline. Pink ribbon belt with beading at the front sown into the waistline, which could be removed. 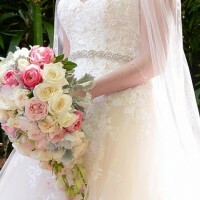 Length was altered - made to fit 163cm / 5'3" tall bride.